As we learned in our post on differentiating yourself in the cluttered digital space, the most successful agencies know their strengths and develop their service offerings around their core abilities. This allows you to better align yourself with a target market and begin to craft a niche for your agency to capture. In addition, you can keep your staffing efforts laser-focused, building your team with top talent than can increase your level of expertise in your niche area. Another great way to keep your team focused on your core business offerings is to outsource. Out of 33 agencies surveyed, 51.52% said that they have outsourced or currently do outsource some part of their services. This week’s Agency Framework “play” focuses on the how’s, why’s, what’s and when’s for choosing to outsource services. Should You Outsource or Hire? As an agency owner, you have two options when it comes to filling a gap in your staff: do you hire a new employee, or do you outsource the job to a contractor? Hiring a new employee requires a larger investment in time and money in the long run; however, if you’re hiring for a position that is immediately relevant to the core parts of your business, it gives you more power in deciding exactly how and when work gets done. Further, your team will grow in a targeted direction and allow your company to scale your core offerings better. We try to avoid outsourcing at all cost. So as a full-service, boutique agency, that means every member of our team needs to be an expert in more than one area or quickly become so. Finding the ideal new hire is seriously painstaking, but avoiding outsourcing, unless it is to a trusted expert, means avoiding sliding into that vast field of mediocrity littered with so many agencies. Sometimes you have no choice but to outsource certain services. Especially if your agency is still at an early stage, outsourcing can drastically reduce costs, but always be aware of quality. Before you make the decision to outsource, there are a number of questions you should ask yourself first. We’ll cover a few of those below one by one. It’s much better to outsource services at the earlier stages of your business to reduce labor cost, management and training. That way, you can work with a team who is already proven to succeed at their specialty instead of creating your own team. 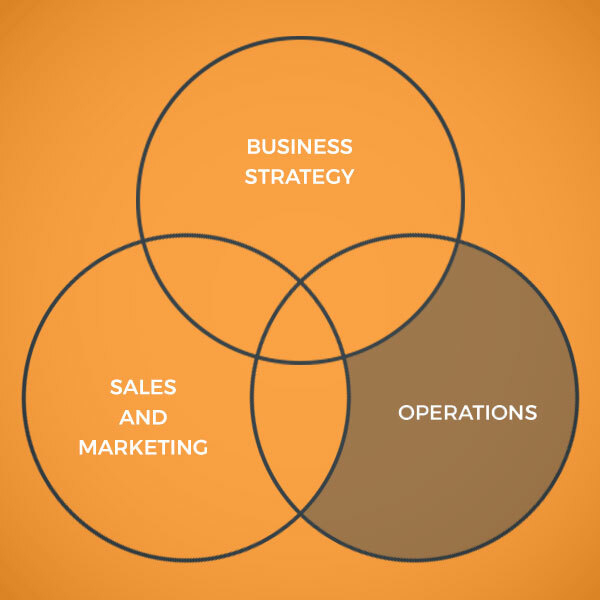 Your services should always align with your business strategy. If your services start to stray too far and you find yourself trying to tackle more problems than your team is equipped to handle, outsourcing can be an easy decision. That being said, reevaluating your service offerings may allow you to reduce costs and get back to doing what you’re best at. It’s almost always best to hire. I’ve seen a lot of folks who outsource because they have a need they can’t cover, and can’t afford to hire someone full time. This is because they’re expanding horizontally rather than focusing vertically. As an example, we do software and digital marketing, and occasionally someone asks us for IT needs. Sure, we could probably find someone to lean on for outsourcing services and fulfill their need, but why? We might make a little extra money, but it’s not a service we desire to support or that we’re passionate about. Over the years we have found that we can’t be great at everything. So instead of trying to do everything we do what we are great at and hire out to subject area experts for everything else. If you don’t have the infrastructure to provide the service yourself, or if you can’t afford to have full-time employee for a particular service than it might be time to look for a good outsource partner. Is This Core to Our Service Offerings? Many of the agencies we spoke with admitted that they only outsource services that are not core to their own offerings. This allows them to keep their team focused on what they do best, and let others take care of the rest. We focus on hiring new talent when it is core to our own service offerings, and we are reaching 85% of capacity. We outsource whenever we can if the deliverables are not central to our core business, and this approach keeps us focused on what we are great at. Outsourcing can actually increase the quality of the work you provide in some cases. Let’s face it: no matter how talented your agency is, you can’t be an expert at everything. If your team does not specialize in a given area, outsourcing can allow you to partner with an expert and increase the quality of the work you provide. Ask yourself if the job is pivotal to the core competency of your business. If the job lies outside of your core competency there’s probably someone else out there who does consider it their core competency; it’s likely they can do the job better than you can. Is This a Permanent Need? Depending on your target market or specialty, your agency’s work may be seasonal. Hiring a full-time employee to cover seasonal work can be extremely costly, so outsourcing is a great solution. For some agencies, your work can be seasonal and at times, it is better to outsource if there is not a guaranteed volume of work. This can be a great opportunity to test someone out for a limited period of time to see if they could turn into a long-term hire or a trusted partner. Sometimes your agency may be struck with an influx of new work that your current team might not be able to fully handle. Before you hire a full-time employee, it’s important to think about the time-frame of the work in question. Will these projects have a lot of ongoing maintenance? If so, hiring a new employee may be the best decision. Is this a temporary increase in your team’s workload? In that case, outsourcing is almost always the top choice. When we have an influx of projects or when we have smaller projects that we don’t want our seasoned professionals to do because we want them to focus on higher-level projects. We may also outsource when a client needs a project at the last minute and we don’t have anyone in-house available after-hours. We only outsource for two reasons: managerial issues or workflow issues. The managerial issues have to do with managing staff employees. If managing someone else becomes too difficult, we will sometimes look at contracting options. We will also outsource certain tasks when we experience an unexpected increase in demand. We try our best not to fall behind on work, outsourcing helps with that at times. Is This Worth My Team’s Time? Ultimately, when it comes time to decide whether you should outsource services you need to ask yourself whether this particular task is worth your team’s time. If you find your team’s time is being eaten up by too much busy work or if you find that they’re getting distracted by repetitive tasks that don’t require much intimate knowledge, it may be best to outsource. What’s more important for this role: an intimate understanding of your business or an intimate understanding of the tools needed to accomplish the task? There’s always some gray-area when answering this question, but if the latter is generally more important, you should outsource. Once you’ve made the decision to outsource, it’s time to choose a partner. This is certainly easier said than done. It’s important to weigh your options before deciding on a partner. Ask questions. Go over some of their previous work. Check their reviews online. No matter how you do your research, make sure you’re comfortable with your choice. Reliability and quality are key, so finding a partner that you can not only consistently rely on, but whose quality of work is up to your agency’s standards can be tricky. Many potential partners try to be everything to everyone and rarely admit they may not be experienced in the type of work you’re requesting. Grill them on relevant work experience, ask the hard questions, and speak with other clients they worked with previously in a similar capacity. Just because they say they’re willing to help doesn’t mean they’re the most capable partner on the market. Remember: the outsourcing partner you choose will be doing work in your name. Your first concern when choosing a partner should be to find someone who you can trust. Not only should they have a solid track record of success, they should also have processes in place for communication and delivery. You should be able to rely on them to complete the work in the time allotted and up to your quality standards. Trust is the number one factor when choosing a partner. Trust is key, not only in their outstanding quality of work, but in them representing the best interests of our company and clients. You need someone you can trust, someone who will be there for the long haul and has a vested interest in your success. Unfortunately, many outsource partners do not, or they’re juggling so many clients that they’re getting a fraction of your attention, and sometimes only doing a fraction of what they said they would do. Communication goes hand in hand with finding an outsourcing partner you can trust. Make sure that you and your partner have an open dialogue so that you can provide feedback and address any issues that may spring up along the way. In addition, your outsourcing partner should provide timely notification if any project is going to be delayed so that you can plan accordingly. Communication is essential. An agency should never go radio silent after a project kicks off. Regular weekly updates should be part of the arrangement so issues can be addressed immediately and feedback is provided along the way. Always give new outsourcing partners a tryout project or two so you can test their quality and reliability. Once they’ve proven themselves, you can build the relationship further. Most agencies will have to experiment before they’re able to find an outsourcing partner that’s a perfect fit, so don’t get discouraged! It’s difficult to screen an outsourcing partner, and most agencies struggle finding an outsource partner that they are happy with. Expect to spend a lot of time and some resources with tryout projects before you find a good outsourcing partner. Very few agencies pick a great service partner on the first try. The decision to outsource services is never easy; however, it can have measurable effects on your agency’s bottom line. Be sure to weigh your options carefully to decide whether hiring or outsourcing is the right move for your agency. Remember: the more you’re able to focus on the core components of your business, the better you’ll be able to service clients and scale your operations. I outsource anything that doesn’t help me build a better mousetrap. I’m in the business of building better mousetraps, so anything that doesn’t help me to that end is a distraction. As a result, I outsource everything from advertising to accounting.